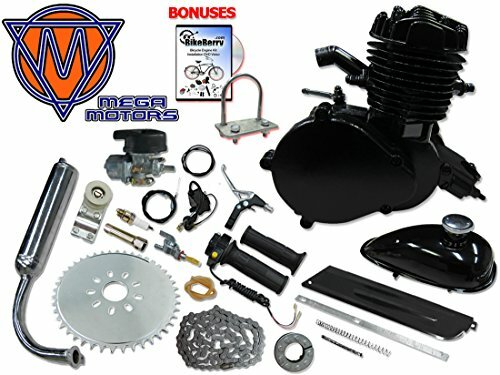 The Mega Motors Black 48cc bicycle engine kit is the smaller form of our best selling Mega Motors engine kit. Don't be fooled by the super low price, though- our Mega Motors bicycle engine kits have the best parts for beginners in the industry! All of our engines feature the latest updates to the standard clutch ball bearings. We make certain that all of our manufactures abide by strict quality control assurance measures and use the highest quality material so that we can make certain that all of our customers get only the best! This kit comes with every thing that you'll need to convert bicycle into a motorized bike- all you need are some basic, household tools. You will still be able to pedal the bike and ride like normal or start the engine by releasing the clutch lever- there's no rope pulling needed! Don't be fooled by other retailers, selling outdated, old generation engines! Whether you're a beginner, or you need an engine that won't hurt your wallet, our Mega Motors 66cc Bicycle Engine Kit is perfect for your next motorized bike build! 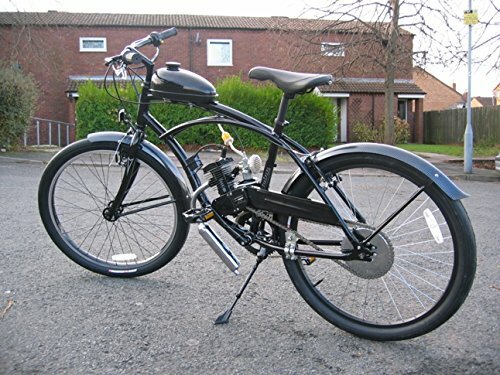 Fits Most 26" Wheeled Bikes (Mountain, Cruiser, Chopper, Road) with V-frame. 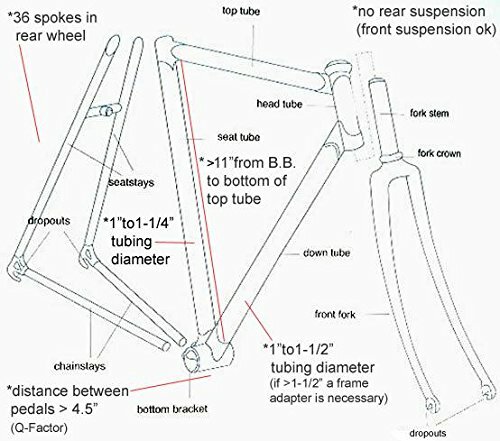 The frame should have 9-11" of clearance between the bottom bracket and top bar, and the diameter of the frame tubes should be 25-29mm (around an 1"). 80cc engine kit is about 8.5" height 7" length 5" width. Kit fits on standard 25mm to 29mm frame tube. Larger frame size requires drilling into bike frame and use the universal face plate. Ensure proper fit by reviewing the minimum dimension requirements diagram on the right. This product is NOT compliant with Environmental Protection Agency ( E.P.A. ) or California Air Resources Board (C.A.R.B) for the use on/off Public roads. Upon purchase, the buyer agrees to use products for racing (closed-course competition) only and NOT for on/off public roads. If you have any questions about this product by Mega Motors, contact us by completing and submitting the form below. If you are looking for a specif part number, please include it with your message.